Their mtDNA haplogroup is N1a, a rare one - especially in Europe. The only place it shows up in any noticeable percentages today is in Saudi Arabia and Yemen. Engeline was Danish, from the German state of Schleswig-Holstein. 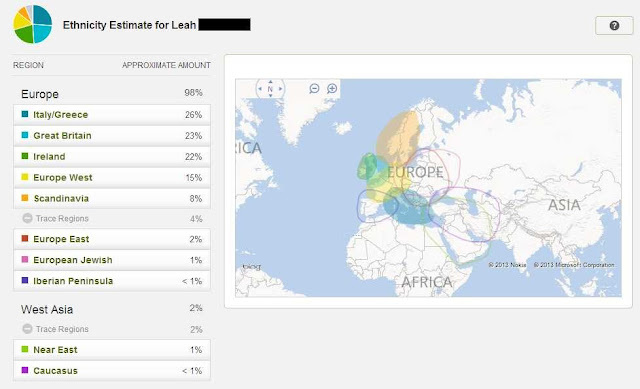 I do not know what their mtDNA haplogroup is, though I have several testing options. Mary lived in Somerset, England and at the time of the 1841 England Census, she was living in the village of Churchill (where her granddaughter Charlotte was born). There are a few testing options that I know of, but I have not been in contact with any of them. I see according to Geneabloggers today is your 4 year anniversary since you've been blogging. Happy Blogiversary. "...He Leaves Five Brothers, One Sister..."